Ever considered cloning yourself in order to help realise all your ideas? NY based digital artist Nathalie Nguyen also known as ‘Spicy’ is giving this some serious thought. Drawing inspiration from Ex Machina and Black Mirror, Nathalie uses technology to convey her design and create an execution worth discussing. You describe yourself as 3D sorceress. For those not familiar with your work, can you elaborate on what you do? Sorcery has a somewhat negative connotation because it often refers to dark magic. I think it started when my friends were casting spells & hexing their enemies that made me realize how far I isolated I was from witchcraft. One day I was explaining the highly technical process of creating a 3D rendered image to a friend and she told me, “hold on my mind is BLOWN... this is like sorcery!” so I claimed it. I like to also think of Ex Machina and Black Mirror. Technology is give the connotation of being evil but I use 3D software to convey my own design language and experiences. In some of your latest Instagram images, such as the shoes and nail art, I truly can’t tell if they are a physical artwork or a digitally rendered one. Is this duality between what’s real and what’s not a part of how you want to present yourself as an artist? I don’t think I need to further the dichotomy of real/unreal for shock value, there are plenty of accounts doing that. I just want to bring to life what doesn’t exist & 3D software removes the limitations of the physical world. People share it, people talk about it, so it must be engaging. I keep people guessing & that’s fun. If you can’t tell if it’s real or not, what made you smash like? I hope it’s because the design and the execution was worth discussing. 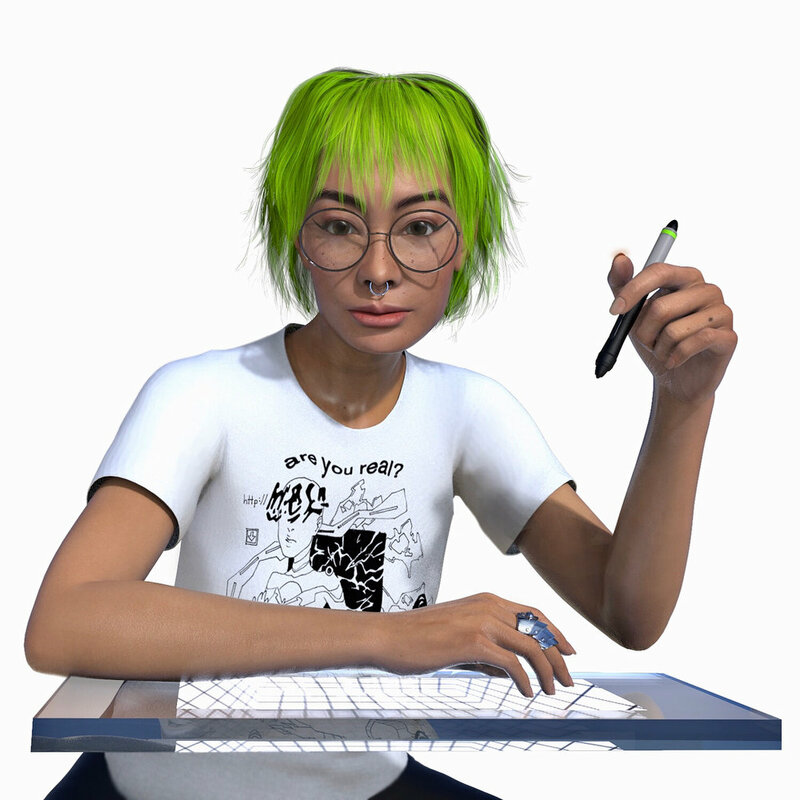 Plus my 3D self isn’t her own person, I created her because I seriously wanted to clone myself to help produce all of my ideas. 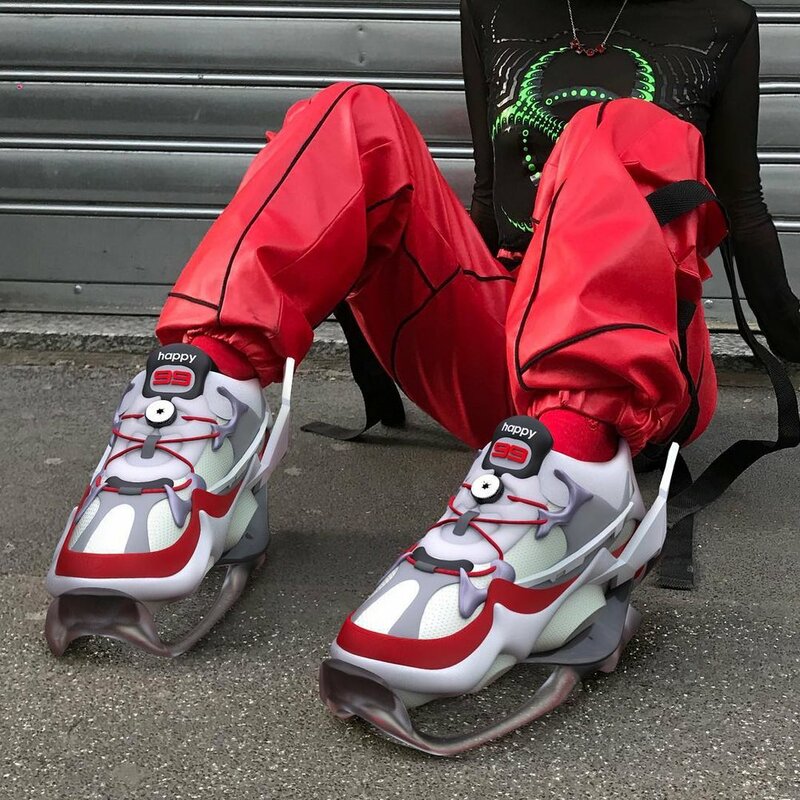 The Happy99 project showcases crazy shoe designs and seems to be inspired by Anime such as Air Gear. Can you tell more about this project? How did you end up moving from doodle illustrations to 3D art? I can’t say I’ve let go of doodle illustrating. I was always using pen and paper to design but when I realized my technical abilities could be used to add a 3rd axis and dimension to work, the switch up felt right. You seem to be a complete chameleon when it comes to the use of art disciplines. What is the link between your works? Is there a singular vision behind them? Haha I blame my gemini moon. The singular vision behind my multidisciplinary art forms is my thirst for experimentation and my life-long pursuit to implement a design aesthetic that is unmistakably mine. I know, pretty ego-tistic but it’s how I don’t get lost in the mediums. During your creative process, what sources of inspiration do you find yourself moving back to? and how do these inspire you? I can’t say I move back to sources of inspiration, I think I often find myself moving forward towards new content other creatives put out around me. I’m aware this is a dangerous statement but as the market becomes over-saturated with work, I find myself inspired by work that stands out from the crowd by cross-pollinating ideas and mediums. What skills would you like to develop further and what is your ambition for the near future? This list could go on forever. I used to dream of drawing a perfect circle but now, I want to master 3D and expand my VR/AR capabilities. For the near future, my entire soul is going into the happy99 project and we’re going to snap.